And the answer is: when you try to change the format until it’s not really an open space session any more. 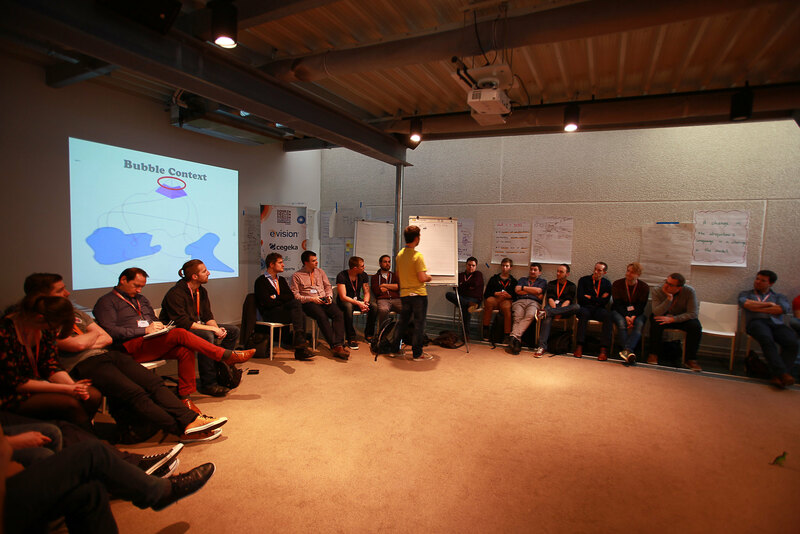 Since 2011 I’ve been running and facilitating dozens of open space sessions in many conferences across various countries: at the Software Craftsmanship Meetup in Paris, in Socrates Germany, Socrates France, in Bucharest’s ITAKE, Agile France and so forth. It always worked fine, except twice. Precisely the two times I tried to mix the open space format with a more structured one. Whatever happens is the only thing that could have, be prepared to be surprised! If at any time during our time together you find yourself in any situation where you are neither learning nor contributing, use your two feet, go someplace else. Note that there is no moderator role, just a facilitator role to remind the rules and organize the very basics like time and space. Anyone can hijack a session, and the law of two feet is supposed to counter-balance that from happening. The form does not promise much and there’s no guarantee you’ll be happy, but because it’s fully interactive you can do the steering yourself by suggesting, reacting, asking questions or answering directly. In practice this means you’re quite likely to be happy at the end. Except when you take risks and try to change the format. At Socrates Germany 2014 I had explained monoids to many attendees. At the same Socrates the next year in Soltau I proposed a session to go further, which I called the ”Monoid Safari”. It was supposed to be a collective exploration to identify more examples of monoids in the business domains of the attendees. I came prepared with a large slide deck “just in case”. I had it ready just in case I had to remind people of what a monoid is, or to show some of the examples of monoids I had already collected and described in the past. I wanted an open space session, but I had a full content for a talk as a backup. It should have been safe. This one wasn’t really a disaster, but was not a success either. Most attendees had no idea what a monoid was, and they came to learn that. I quickly found out that my plan was not working, so I tried to explain monoids quickly to carry on to the safari. But still questions were coming: “do you have examples?”. “Oh yes I have some, here they are”. And I jump to the most appropriate slides to show some the examples, quickly. And still hoping to come back to the safari right after. More recently, at DDD Europe in Brussels I had proposed an ambitious session called ”Bounded Contexts: the Illustrated Bestiary”. I consider myself knowledgeable in DDD and Bounded Contexts, which also means I have open questions on the edge of this topic. I thought this conference dedicated to DDD was the best place to find knowledgeable peers to discuss that and try to answer some of the puzzles. So I proposed this session, precisely because I do not have all the definitive answers. From one entry in the Blue Book, Bounded Contexts have since evolved into a bestiary of mythical creatures like Bubble Context, Interchange Context or even “Uber-Context”, each with different rationales that somehow challenge their initial definition. We now have recurring relationships between them like in the Collaborative Construction pattern. We now know that Bounded Contexts are a solution thing, not a problem thing, but some confusion remains, and we can make the matter even more confusing with crazy questions like ”Can Bounded Contexts be nested?”, ”Are Aggregates mini Bounded Contexts?’ or ”Is it useful to say that legacy UI and DB layers are their own Bounded Contexts?”. During this semi-structured Open-Space session, every attendee can contribute examples or feedbacks, ask questions and share their ideas and opinions on this topic. Contributions in any form (slides, pictures, code…) are also welcome prior to the session and will be be credited. Given the topic is very abstract I had in mind to run for 1 hour, no more. And I was expecting just a few attendees. But the program generously planned two hours, and more than 40 people came in early, sitting in a very large circle! Again I came prepared with a slide deck covering each example and concept mentioned in the abstract, “just in case”. From the start it appeared that many attendees did not clearly know what a Bounded Context was, and they came to learn that more in-depth. So I started to explain quickly. As I felt tied by the abstract, I tried to cover all the questions, quickly. It was uncomfortable switching from lecture-style and then back to open space style, and again quickly, every 5mn. At this pace I was also speaking too fast, which combined to my French accent is a recipe for disaster. And it was a disaster! Thinking about it, the format I was looking for exists and I know it well, it’s just called a training, not open space. And that’s funny since that’s already the way I do trainings! Although it may look like conversational, it remains actively directed by the trainer. In the ideal situation, the trainer does not have to talk that much, as the learning happen thanks to exercises, discussions and coding. But still, this is not open space. However a training assumes that the trainer knows the topic completely. So how do we do when we want to create opportunities to discuss topics precisely to clarify open questions and to explore the boundaries of our knowledge? When there’s a pre-requisite level of knowledge to even listen and follow what’s happening? So far the best opportunities I’ve met were in conferences hallways, during random discussions with speakers and attendees, unfortunately always too short and usually without taking notes. Advanced topics can be discussed during open spaces of course, as it regularly happens in various Socrates un-conferences, but it’s usually between small groups, the topics are broadly defined, e.g. “Combinators in FP”, and the answers usually exist in the literature.